The Drexelbrook DM231 level transmitter offers high accuracy magnetostrictive sensing performance with field programmable span. The Drexelbrook DM231 is an explosion proof liquid level transmitter offering high accuracy measurements based on the magnetostrictive sensing technology. The DM231 comes with a Modbus RTU digital output (optional analog output converter available) for total level, interface level and temperature sensor outputs. Sensors are available in 316SS rigid designs with a choice of single or dual NPT mountings. 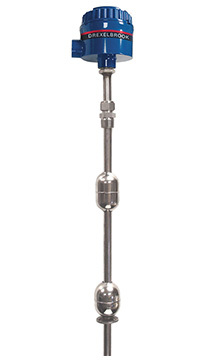 Temperature sensors are evenly distributed over the active length of the rigid 316SS tube. Due to a wide selection of floats and mounting accessories this level transmitter fits virtually any application. The DM231 level transmitter is FM approved for Class 1 Div. 1, Zone 1 Explosion Proof hazardous area installations. It is easy to install and requires no calibration. Request more information to see how we can help you with a magnetostrictive level transmitter that suits your need. Condensation, changing compositions, maintenance and stratification can cause problems in level control. Drexelbrook offers the ideal solution. Save time and money by using the DM231 magnostrictive level system for temperature and level measurements in oil tanks. Avoid constant maintenance and re-calibration due to condensation and compositions change. The Drexelbrook DM300 is unaffected by density, coatings and variations.